Last week s.e. smith and several other members of the disability community, including Alice Sheppard (a dancer with AXIS wheelchair dance company), TK Small (a lawyer and disability rights activist), Christine Bruno (who works with the advocacy group Alliance for Inclusion in the Arts), and Maysoon Zayidd (an actor and comedienne with Cerebral Palsy). came together on the WBAI show The Largest Minority to discuss Glee and depictions of disability in popular culture. This particular episode of the radio show was inspired by s.e.’s post, A Very Glee Christmas. You can download directly from their site: This is a direct download link to save-as. Alternately, you can play it on the WBAI site by going to their archives and scrolling down to Shared Timeslot Wednesday 10pm to 11pm on Wednesday, December 22, 2010 10:00 pm. Alternately, you can read the transcript. The actual show itself doesn’t start until 3:52 in to the program slot. It’s taken me a while to get the transcript of this done, for which I apologize. I did mean to get this up far faster than I did. I also should note that I had some difficulties always identifying who was speaking, and there are points in the program where the show’s audio cuts out terribly and I’m unsure what they’re saying. Narrator: In August, I had the privilege of representing the Global Fund for Women at the Women’s Institute on Leadership and Development, or WILD, a three-week program hosted by Mobility International USA. Women disability rights activists came from 34 countries to a serene natural setting in Eugene, Oregon. They came to share with each other their wisdom and strategies for how to win recognition, inclusion and rights for the disability community. During the final week, WILD alumni and representatives from international organisations particpated by networking, mentoring, and discussing gender, disability and development. From these incredible women, I learned how it feels to be excluded from the mainstream women’s movement in India, how it feesl to be marginalized in a male-led disability rights movement in Botswana, and the importance of bringing women with different disabilities together for a stronger and more unified voice in every country. Some of our grantees shared with me what receiving a Global Fund Grant meant to them. Jasmina: I’m Jasmina Risteska from Macedonia, and I’m working for an organisation, Mobility Challenge. Our focus is women with disabilites and their inclusion in every aspect of social life. The great work the Global Fund for women is doing is that they support us in the most difficult moment for us, that is, our beginning, and thank you very much Global Fund for your support. Ekaete: Hi, my name is Ekaete Umoh. I’m the Executive Director of Family-Centered Initiatives for Challenged Persons, an NGO working with women and girls with disabilities based in Nigera and a Grantee of Global Fund for Women. I really want to thank Global Fund for Women for giving us the foundation which we are standing on today. In 2004 we got about $6,000 from Global Fund for Women to support our organisation and since then things have really changed. The money came when we needed it the most and it was so strengthening, it gave us the energy to move on. With that money we’ve been able to do a lot for our organisation, and the issues of women with disabilities in Nigeria has been brought to the front burner. Karine: I am Karine from Armenia. I am the President of Agate Center for Women with Special Needs NGO. Our NGO was founded thanks to the grant provided by Global Fund for Women in 2007. I want to thank them for their support and trust. They were the first who trusted us. Alicia: My name is Alicia Contreras and I am disability activist. Thanks to the Global Fund I got a grant and I started a women’s program in Mexico. I started the first independent living center for women with disabilities, and without the Global Fund I would not be able to do it. My advice for those who think you can’t do it, do it, try it, start it. Narrator: After the program, women returned home energized to overcome challenges and raise the visibility of women with disabilities in their communities. I, too, left eager to be a stronger ally to the global women’s disability rights movement. These loud, proud and passionate women have deeply inspired me and I will hold their vision, songs, and laughter with me forever. We want to be a part of your community. Jesse the K hopes you can take a disabled feminist to tea this month. Her previous guest post was Making Space for Wheelchairs and Scooters. There are many things we can do to improve everyone’s lives. Voting is not the only thing, but it sure is easy to do. Many have given their health, their peace of mind, and their lives for the right to exercise the franchise. If you live in the U.S., join me[1. As long as you’re government approvable, that is, you’re the right color or rich enough to become a citizen or you haven’t been arrested or too recently paroled as part of your systematic community destruction program] and head on down to the polls in your municipality this coming Tuesday. And while you’re there, you might be wondering, “Gee, just how do people with disabilities vote?” As it happens, I know a little about this. CAPTION: laptop size plastic machine with letter-size screen. Woman using powerchair, wearing purple hat and favorite[1. How do I know it’s her favorite jacket? 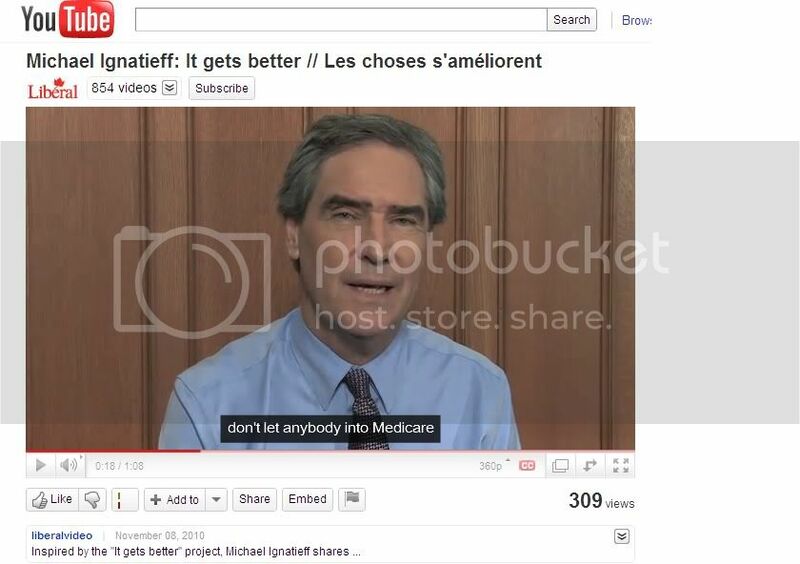 I modeled for the photo] purple jacket feeds ballot into slot below screen. One decent result from the G.W.Bush administration was that the voting process must be independently accessible to people with disabilities. Before then, most people with disabilities would enlist the assistance of a helper where needed. Then they’d vote absentee (returning the ballot in the mail) or bring the helper into the voting booth on the day. I remember assisting a blind person with a mechanical voting machine–a lever for each name! Xe jested that it was a refreshing change to depend on someone with whose politics xe was unsure (as opposed to xir long-time partner), and yet the joke had a bit of a sting to it. Reflecting strong republican sentiment in the U.S., voting is controlled at the lowest possible administrative level. Voting techniques vary widely from state to state (sometimes city to county). In Wisconsin you can register to vote five minutes before casting your ballot, but in some states you must register 30 days in advance. But since I can now depend on getting my power wheelchair into the polling place, it seemed like a good year to volunteer as a poll worker. I went to the “new election official in Madison” training today [Editor’s note – October 28]. a) Everybody votes using a machine. In this case, one of the machines needs to supply large print, speech output (usually to headphones), touch screen input (no grip required), single-switch input (more details below) and various other hardware “hooks” to the wide variety of assistive tech in use today. b) Everybody marks a paper ballot, then feeds the marked ballot into a tabulator (a tallying box like the dollar-bill slot on a vending machine). OK, back to the end of my training session, where I noted she had never gotten back to the voting machine. She said the accessible voting machine is very important and everyone must have one working at each polling place. She said they could be used by someone who’s blind, or someone who has low vision, or can’t read for any reason, or really just anybody who wants to. She also said that they were very fussy mechanically, so they may not work as well as you’d like. Another trainee asked what poll workers should do if they thought a voter was being unduly influenced in filling out a ballot. Xe said, “This happened around 6 years ago, when someone who, well, frankly, he was just not cognizant enough to be voting. 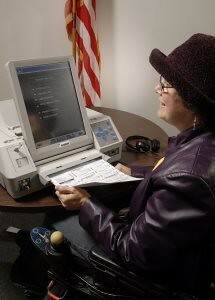 And the person with them was filling out the ballot for them.” I piped up that this could be a good option to use the accessible machine: somebody who can’t read could be able to understand the speech. I asked if that meant my rights as a voter were also frustrating her? How would she feel if I said that permitting her to vote was too difficult? The penny dropped, and she began to apologize for “not presenting in the most effective manner.” At this point her supervisor’s ears pricked up. “Who was deprecating use of the voting machines?” The trainer allowed that her “initial presentation was sub-optimal.” While I was gratified that she’d finally understood, I was frustrated that this right, so long fought for by so many, is still not a matter of fact in our daily lives. If you’re up for some voting day advocacy, the U.S. Department of Justice provides a detailed guide for access verifiers at Voting Checklist. Folks outside the U.S., what’s the voting situation for you? Thyroid Cancer Treatment Affects the Abled, Healthy. Everyone Panic! I have a little bit of a problem with people being handed down a mandate that insists they behave in a certain way or adhere to a certain set of guidelines for which they are not provided the means to do so. Usually, these rules or mandates are set by people whose lives the rules will never affect. I see it all the time here on the Garrison — rules that restrict the lives of military spouses set by Upper Brass who wear uniforms and sit in offices all day being briefed by people who don’t have to figure out how to tote around a couple of toddlers, diaper bags, strollers, car seats in case they might need a taxi while running to appointments, getting groceries, and picking up or dropping off older children at school without having a vehicle. I recently witnessed it in hospital policy regarding patients on long-term controlled substance use (something I should write another post about, eh?) — a pharmacist notices a patient prescribed a certain medication for a certain length of time, alerts a committee who sends out a generic letter triggering a “Single Provider” program without anyone actually meeting the patient involved. Now, I read that a Congressional committee has noticed that patient being treated with radiation for thyroid cancer have been possibly exposing other people to, yes, radiation. Well, let’s think about this for a moment. In the past, people who had thyroid cancer and who were insured and who were given this treatment were allowed a hospital stay so that the very strict regimen of sterility could be followed without putting extra strain on the patient. Then, someone got an itch and decided that it was just too costly to keep this up and that these leaches could just go home and do their own laundry every day. Not to mention, I am not sure what they are supposed to do with their garbage, how they are supposed to quarantine themselves from their families if they don’t have separate wings in their homes to live in, or how they are supposed to get home if they are weak from treatment and live alone. The new regulations are supposed to discourage patients from taking public transportation, from staying in hotels, and from a whole slew of other things that really don’t take simple practicality into account. I think we can all agree that not exposing people to radiation is all around a good idea. I have no idea how much we are talking about, and the hyperbolic pictures of HAZMAT masks on the paper edition article I read didn’t help, but it must be significant if it is causing such a stir. Though, spokesman David McIntyre says it is “unclear” if the levels are harmful. I remember getting a bone scan a few years ago and the tech had to wear a suit, and the dye they injected into me came in a lead tube. I was told I had to avoid metal detectors and public transit for a few days and was given a card to show that I was recently injected with radioactive substances. But I was a single mother, and a sailor, and I had no one else to help me out. Back to work I went, showing my card to security, who walked me through the non-metal detector way. I picked up my kid from daycare later, and drove myself home. I imagine that someone who has no support system who might be in a similar or worse situation would have to make similar decisions. So, I can see how people would disregard directions to go straight home. Perhaps home is a day’s drive. Perhaps home is filled with young children and has only one car available. A hotel and train ride might be the only option, since the loosened restrictions mean that insurance will not pay for a hospital room that is no longer required. Or perhaps there is no insurance at all, and it was all a patient could manage to scrape up the cost of the treatment in the first place. There are so many reasons that these restrictions are not being followed, and I feel like this article, this committee, and this investigation are looking more at the people who are ‘violating’ the rules and less at the systemic problems that cause them to do so. So, yes, those poor, unsuspecting people who have fallen victim to the carelessness of these cancer patients who have been so selfish to expose themselves to the world are who we should be focusing on. They are the true victims here, not the people who are trying to get healthy again, whose bodies are fighting cancer, and living with poison in them, and who are also now having to deal with the extra burden of a cumbersome set of rules of conduct for how to navigate live with a poison inside their bodies. The conversation is not, nor never is it, about them, but about the people around them whose lives are affected by their treatments, the ways those treatments impact their lives. All about the abled body, never the chronically sick or disabled unless it somehow affects the healthy and able. Unless Congress is willing to establish a way to provide a place for these people to stay — all of them — I don’t see how a more enforced set of restrictions is reasonable. You can’t force a person to stay in a place they have to pay for against their will, and you should not be able to punish them because they had to use the resources available to them to survive. These are just my own personal musings. I, of course, have no personal experience with these situations, but I grieve at the idea of restrictions that people might not be able to handle through no fault of their own. I wonder if Representative Edward Markey (D – MA) and the Subcommittee on Energy and Environment are interested in hearing any of our thoughts on this matter while they re-think the policy. When she became unexpectedly pregnant they were pleased rather than concerned. They had organised a white wedding in church, bought a dress and rings, arranged the reception and were eagerly anticipating their big day. Mark recalls: ‘We were about to go out and make a few final arrangements for our wedding when we heard a frantic rapping at the front door. Then came the second bombshell – their baby would be removed at birth. Once again, social workers believed her learning difficulties could lead to the baby suffering ‘emotional harm’. ‘It was as if I didn’t matter as a father,’ recalls Mark. He now believes that Fife social services had made up their minds that Kerry would not be able to keep the baby even before they had assessed her as a parent. Because of this, days later the couple made the heart-wrenching decision to flee the UK and go to Ireland because they believed Irish social workers would prove more sympathetic. Still, the facts as presented do raise an awful lot of concern. Kerry supposedly had mild learning difficulties, but despite having worked successfully as a childcare assistant at a local school, social workers deemed her unfit to look after her own child. They also seemed to be treating the case as if it consisted of a lone parent with intellectual disabilities, not as a committed couple in which only one party had any impairment. When they arrived in Ireland and Kerry gave birth, social services removed the baby and reunited only Kerry with Ben two weeks later, expecting her to prove herself to them on her own, rather than as she would be living, with her partner. Of course, there would be times when she would be left alone with the baby, but these would not be all the time when her husband was not around, as she would likely have friends with their own babies who would be able to give her some support. I’ll say it again: everyone does it. Disability support funding is limited, and the constraints around it are incredibly restrictive. For many parents of children with significant disabilities, it means they are unable to work, as they spend most of their time supporting their kid. Of course they’re going to attempt to get a small amount of compensation for this work – in this case, $40,000 over 8 years, of money that they were entitled to anyway. Yet the Ministry sees fit to chase them down and slam them with 5 months home detention. A recent study by Green of 200 chronic pain patients in the University of Michigan health system found that black patients were prescribed fewer pain medications than whites and that women were given weaker pain medications than men were given. The research published in the Journal of Pain showed that, on average, a minority pain patient would be prescribed 1.8 pain medications compared to 2.6 drugs for non-minority sufferers. Kathy Jurgens, program manager for Mental Health Works, a corporate training program offered by the Canadian Mental Health Association in Toronto, says that a changing view of the workplace is allowing the concept of psychological safety to take hold. “If you think of the younger generation, they have different expectations of what work means to them and what they’re willing to engage in for a paycheque,” she points out, adding that younger workers are less likely to accept a workplace that expects chronic overtime and unreasonable demands. “I think it’s long overdue,” Jurgens says of the current approach to psychological safety, suggesting that mental injury in the workplace has been a problem for hundreds of years. It is with great sadness, that we at Disability Rights International (DRI) mourn the death of Paul Steven Miller, a former DRI board member and a legend in the disability rights movement in the United States. Paul died at his home on October 19, 2010, following a long illness, surrounded by his family and friends. Born with achondroplasia, a genetic condition that results in dwarfism, Paul graduated from Harvard Law School in 1986 – several years before the passage of the Americans with Disabilities Act of 1990 – and experienced firsthand the need for such legal protections when 45 law firms rejected him during his employment search, with one member of a firm telling him the reason: Their clients would think that they were running a “circus freak show.” But despite facing such overt discrimination in his early career, Paul became an internationally acclaimed expert in discrimination and disability law and was the trusted advisor on these issues to Presidents Clinton and Obama. Following the election of Bill Clinton in 1992, Paul was appointed White House liaison to the disability community. And in 1994, Paul was appointed a Commissioner of the Equal Employment Opportunity Commission (EEOC), where he served ten years. In 2004, Paul left the EEOC and accepted the position of professor and director of the Disability Studies Program at the University of Washington. In early 2009, Paul took a leave from the university to become Special Assistant to President Obama for managing appointments and nominations to the Department of Justice and the Department of Education. Additionally, Paul served on the Obama transition team at the Department of Labor. Paul is survived by his wife, Jenni Mechem and his two young daughters, Naomi and Delia. Our thoughts and love go out to them as we remember the amazing Paul Steven Miller.